Home > Tutorial > What is TweakBox App? 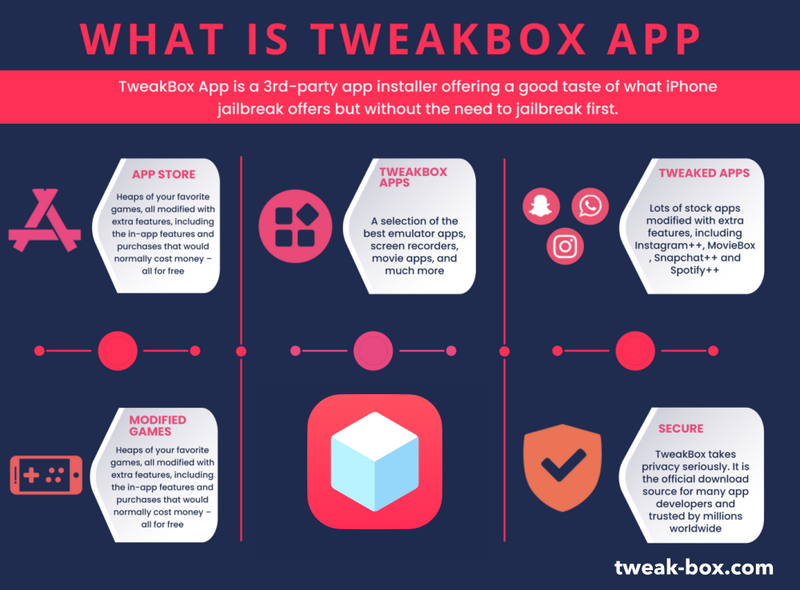 TweakBox is one of the best, most robust, of the application installers that helps us to install third-party apps and games on our iOS devices. Perhaps the most important factor is that it doesn’t need a jailbreak to make it work, opening it up to many more users. This app installer is regularly updated, not just with new content, but with support for the latest iOS versions and security fixes. Many of the included games or apps are stock but with a few extra tweaks added to make them work better and offer more function. 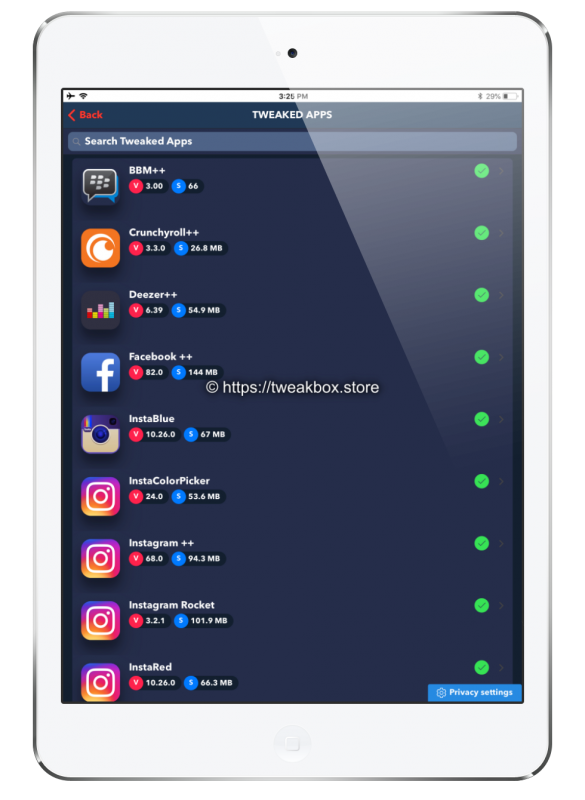 Tweak Box is a feature-packed app installer, more like a third-party app store. Inside it, you will find thousands of different apps and games, including some modified and you don’t need to install Cydia on your device first. This is great news; so many users have been waiting for an alternative to Cydia for so long that this is expected to be an incredibly popular solution. And, because we don’t need Cydia, even those who never wanted to use it in the first place can now have some of the extra features. Modified Games – Modified versions of games with in-app features, such as unlimited lives, coins, etc, all included. How Does TweakBox App Work? TweakBox uses Apple’s Enterprise Developer certificates which are bought by Developers and then distributed to common users, allowing them the special ability to download and run unofficial apps. This certificate is embedded into the TweakBox app, so once you download and install the TweakBox App Profile, you can, without any restriction install modified apps and games. This app installer really is very simple to download. Follow the steps at the linked post below, you will have TweakBox on your device in a matter of minutes and a whole heap of useful content at your fingertips. You won’t find Tweak Box anywhere near as comprehensive or in-depth as Cydia was but, for most users, it’s the best solution we have right now. It costs nothing to try it but, if you do find that you can’t get on with it, deleting it takes no more than a few seconds and your device is restored to how it was. Try Tweak Box in your iPhone or iPad today and tell us how you get on with it in the comments below. Follow us on Facebook and we will keep you updated with all the latest developer updates. hi , what is the issue that you re facing ? Hey josh , if you need it immediately , i would suggest using Emus4u.app for the download, they might have it working on their site right now. Hi just to let you know none of your hacked games are working. does any of the snapchat apps work? The pokemon go app requires an update, any idea how long it will take for you guys to update it too? @TweakBoxApp Hello, When will the game “City Island 3” work again? I have the iPhone Xs Max with iOS 12. I can download it but it will not open afterwards. retry please. the apps are now fixed. Can you please share how to add my application to this store?